Who is Aunty Rhonda Dixon-Grovenor? Aunty Rhonda Dixon-Grovenor is a Darug/Yuin elder and daughter of Aboriginal activist the late Dr Charles ‘Chicka’ Dixon. I would be living on the South Coast of New South Wales on my traditional land, getting up to greet Grandfather Sun every morning going for my morning walk along the beach then going to my chook pen to gather fresh eggs Later tending to my vegi patch. Writing my PhD siting in the cool playing my ukulele while waiting for my family and my 10 beautiful grandchildren to come stay with me. My father Charles ‘Chicka’ Dixon and other Freedom fighters from around the world inspire me to do what I can by bringing focus (in my way with what skills I have) to the injustices and suffering of all people, animals and mother earth in Australia and worldwide. To make a difference in the world I would follow in my father’s footsteps by continuing the fight for freedom. My favourite holiday destination is the South Coast of New South Wales Its beautiful untamed and spiritual land it’s a part of me and who I am. When overseas friends come to town I like to take them on a tour around Sydney to Aboriginal organisations and sites. (As there is not a Aboriginal Arts and Culture Centre here in the City of Sydney) I take them and introduce them to Aboriginal people so that they can go back to their country with knowledge of the original people of Australia. I am currently reading the script for the play (which we have been making for the past four years) called The Fox and the Freedom Fighters. The play is about my father, Chicka Dixon. Happiness for me is when there is peace in the world and when the Australian Aboriginal people have been rightly and morally compensated for their loss of land and for the 220 plus years of the trauma and grief they have suffered since colonization. For me the future holds at least another 50 years of living on this beautiful mother earth Because I still have a lot to learn to do and experience. I will not live my life as a good woman but as a vibrant exciting outspoken woman. If I can live the next fifty years of my life following in the footsteps of my father it will be certainly be a challenging exciting and fulfilling life. The Fox is coming! 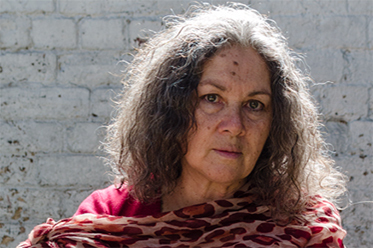 Rhonda Dixon-Grovernor is a Darug/Yuin woman with over 50 years experience as an entertainer and Cultural Arts Educator. For the past 7 years Rhonda has been active as a researcher, writer / director and actor in plays such as Posts in the Paddock, which was broadcast on Message Sticks. Rhonda has a Diploma In Music, Centre for Studies in Aboriginal Music, and undertook a one-year scholarship program at (UCLA) University of California Los Angeles studying Ethno-musicology. She has a Masters, Aboriginal Studies, (Social and Emotional Well Being). The Fox and the Freedom Fighters will be presented at Carriageworks from 12 – 22 November as part of Performance Space: Buruwan. For more information, visit: www.performancespace.com.au for details.